Your dog is a member of your family. He rides with you when you go to the beach, tags along on road trips, and jumps at every opportunity to stick his head out the window while you cruise the countryside. 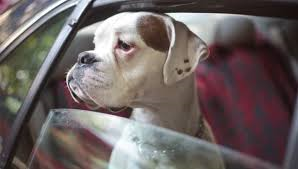 When you bring your dog with you in the car, you want him to stay safe, but you also want a car that was built to accommodate him. According to Edmunds.com, these are the top 10 safest cars for your dog, plus they have a few little perks thrown in to make life with your dog that much more enjoyable. Ford Flex — Just one look at this crossover and it is clear that your dog will have ample room to roam even when constricted to the interior of the vehicle. Subaru Tribeca — Subaru is known for its safety, and the Tribeca is no exception. It has top crash test scores and even includes a rear back-up camera. Dodge Journey — This stylish SUV will not only keep your dog safe, it also includes a cooler in the dash to keep beverages or pet food safe for your little guy. GMC Acadia — When you are taking your dog out with you on a nice summer’s day (and what better time to do so? ), the rear of your car can get hot. Luckily, the Acadia solves this problem with tri-zone climate control to make sure your pooch’s pad stays cool too. Hyundai Tucson — Again, heat is a major concern when you have your pet with you. That’s why the heavy-duty privacy glass that the Tucson offers is ideal for blocking out some of the sun’s rays. Mazda 5 — The sturdy tethers and anchors in the back two rows of this vehicle allow you to secure your pet’s seat safely. Jeep Liberty — If you are all about brand loyalty, Jeep is the way to go because they even offer matching travel gear for your dog (carriers, crates, ramps, etc.). Kia Soul — If you do get in a collision with your dog in tow, the Soul’s side-curtain airbags will keep the entire family safe. Mitsubishi Outlander — When you need a lot of room for your dog, the Outlander can provide it. It boasts seats that fold flat and a third row that can be stowed for more than enough room for any dog. Volvo XC70 — We know you always drive defensively, but if you are really worried about getting in an accident, the XC70 may be the perfect choice for you. It has an available pet barrier that will stay strong in a collision.